Hey everyone! Today I bring you a toasty color that to me is perfect for any season but best for fall. Just the name of the polish itself should tell you to expect a dusty, cozy fall-like color. Were you expecting a brown polish or greyish one? If you were, you'll be pleased to know that Sally Hansen - Espresso is none of them above but so much more! I think the name Espresso describes this color nicely even if it isn't a creamy brown. I am not a coffee person so I had to go Google espresso, lol. Okay, so maybe this polish wasn't named after espresso espresso but who cares, right? As long as this color is awesome, nothing else matters, at least to me. I used 2 coats of Sally Hansen - Espresso here and one coat of Love and Beauty's shimmery glass flecks. The pigmentation of Espresso is lovely - no streaks or patches, yay! - and it didn't flood my cuticles. I am definitely in love with this polish and I highly recommend it for the fall. Do you like this color? Do you have this polish? How do you like it? Are you a fall polish kind of person or do you just wear any color during any season of the year? I just wish I could get polish to last longer!!! Hi, I love this color! Next time I'm at Walgreens I will pick up this color! Have a great weekend. Isn't it lovely? Yes, definitely pick it up. :D Thanks for coming by. I like it! It reminds me of hot cocoa :) And I like the sparkles you added to it! 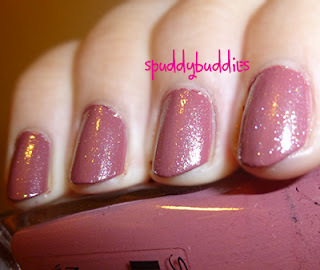 Essie makes a great taupey-brown-cocoa color with micro glitter in it that gives this same sort of effect. It's called Mochacino, in case you want to find it! Thanks! I love finding new taupey polishes. If I ever find a shop that carries Essie here and isn't a whopping 60 bucks, I'll definitely get it. This is gorgeous :) I love that color! This is such a pretty color, but not what I would expect by the name! That's a really pretty color. 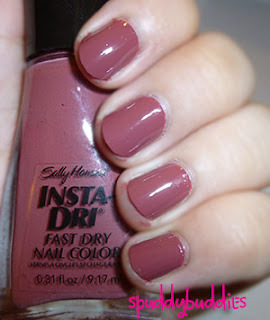 I need to try the Insta-dri polishes. I always smudge mine.